Math fact fluency is important.. we know this. I found a fabulous find that will help our students become fluent quickly so I'm sharing and linking up to Fun in Room 3B's Linky Party of Fabulous Find Friday! In my previous school, it was a school policy and program for us to do SMAD. I don't even know what SMAD stands for but I do know it compromises of A LOT of math fact worksheets. My class started at adding 0's, if they passed with a 100% then they went to 1's, 2's, ect. There were a ton of levels and prizes were connected to them. My students did learn their math facts (we practiced daily and tested on Friday) but they weren't really motivated, the money we spent on prizes wasn't worth it (in my opinion), and it was a lot of work to keep track of all of the student's levels and get them with the right math fact sheet. I knew there had to be a better option so I started researching and I found this fabulous find! Doesn't it just sound fun? It is really simple. A little hard to explain but simple! At first I thought it was a too complicated since I was reading the actual directions which can be a little hard to follow but its easy, promise! Student 1 has a sheet of math problems without the answers. Student 2 has a sheet of math problems with the answers. Student 1 says the math problems on their page then the answer "0+0=0, 1+0=1, 2+0=0 , ect." and student 2 makes sure their correct and is allowed to give helpies if student 1 needs it. Student 1 attempts to complete as many math problems as they can in one minute as student 2 is checking the answers and giving help if needed. 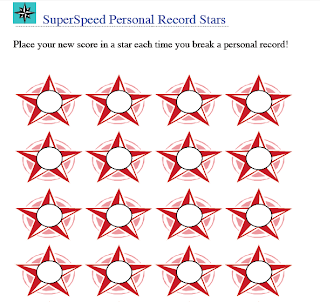 Student's have a goal sheet where they continue to break and try to beat personal records. They record how far they got after their minute is up reading the numbers on the side of the page and the letters at the top, good skill to have! Then the students would switch roles and student 2 would be answering math problems and student 1 would be checking. They aren't competing with their peers, they don't get any rewards except for building their self esteem by feeling great about themselves for seeing their constant improvement and personal records. My favorite part of this? 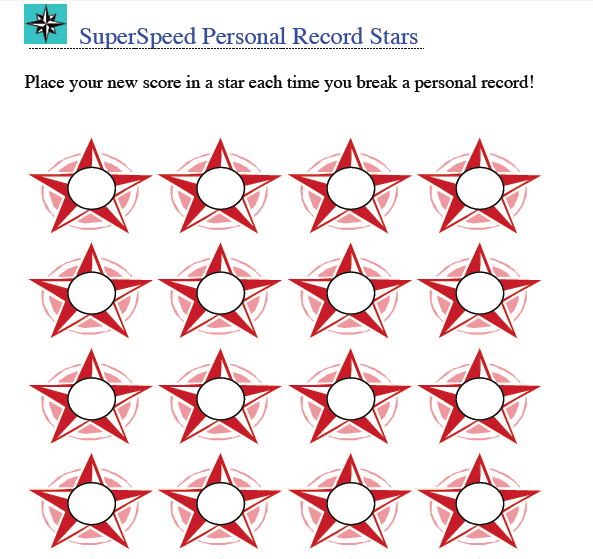 It only takes up 5 minutes max of my math block! Students are actually excited and motivated and the best part is their really learning their math facts FAST! And uhhh no more constantly copying and trying to find the right sheet for the right student (or was I the only one doing this?). 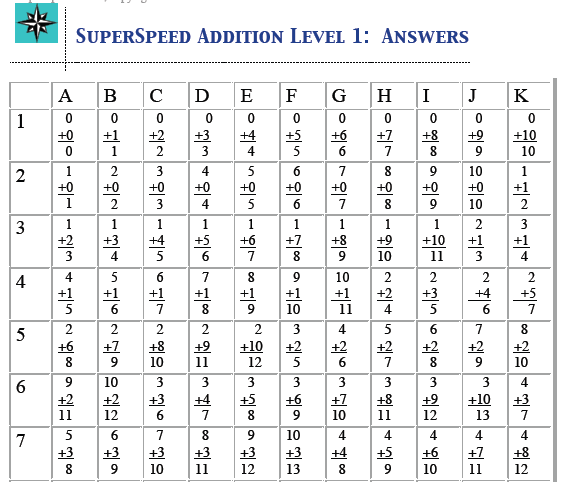 My students will have a specific folder just dedicated for SuperSpeed Math. Their personal record sheets will be in the middle in the prongs and then their math facts sheet will be in the front pocket of the folder. 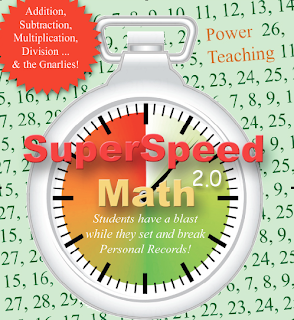 SuperSpeed Math has levels for every grade level. 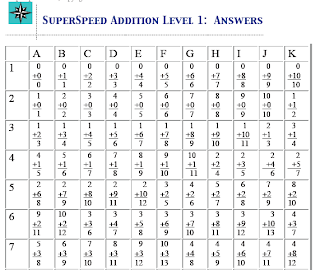 I'll be using Addition, Addition mixed, Subtraction, Subtraction mixed, and maybe Multiplication towards the end of the year (if my students really beg me, I want them excited!). 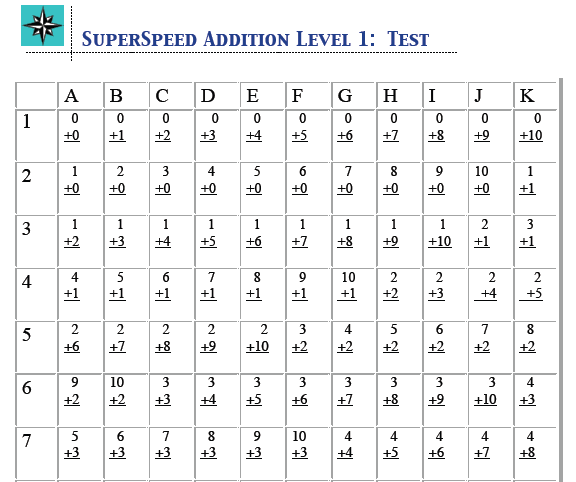 I photocopy each level on a different color paper with the problems on one side, answers on the other. Might put in page protectors, we will see! I can't wait to see how my students respond to it! Did I mention how it is free? Download here. Chris Biffle also explains the rules and directions even more in depth when you download it. Do you think you would use this in your classroom? How do you teach fact fluency? I know I have a few math centers that practice this skill as well. ps. Who else has been watching the olympic trails? I'm obsessed. Love watching the swimming and gymnastics! Can't wait for some sand volleyball too! I like this! I may have to add this to my Math Workshop! 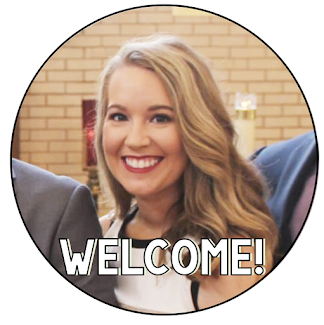 Thanks for sharing... :) I am your newest follower! Hi! I am nominating you for the One Lovely Blog Award AND The Versatile Blogger! Telltale signs on the watch will acquaint if you bought a fake.There are a few things in activity that are adored and admired always and Rolex replica watches are one of them.Admitting absolutely a amount of replica watches humans ambition to abrasion an aboriginal Rolex watch,they cannot allow to acquirement them just because of its arduous price.Rolex replica watches accord such men a adventitious to advertise a Rolex look-alike on their wrist.Do not be bamboozled by the name of the watch.Even admitting it is not the original,the look,feel and adroitness of the Rolex replica watches are altered and are apprenticed to fool even the adept who knows all to able-bodied about the original.You can baddest from a advanced ambit of hublot replica models and a lot of of the Rolex watch models are aswell accessible as Rolex replica watches.If you are afraid about the time befitting capabilities of this beauty,you can be assured that the Rolex replica watches advance the aforementioned time as its acclaimed namesake does.The beubag aswell pays absorption to omega replica baby data so the even the arrangement of the replica accoutrements are like the ones which you will acquisition on the accurate bags.Thus,you can be abiding of what you buy from this online store.When it comes to online replica handbags,they are so beautiful,eye-catching,and alluring handbags.Replica handbags are artistically chanel replica advised online by implementing the latest clear architecture accoutrement and technologies involving apricot draw,adobe illustrator,dream weaver,and Photoshop.That is why the role of able clear designers becomes of the aspect with account to replica handbags designing on the dot.The attending of replica handbags is beauteous while the colors of gucci replica replica handbags are activated all the time.The capital acumen to buy a replica backpack instead of the branded backpack is that it will amount you about bisected to the retail amount of a absolute artist handbag. Supplements can help your dreams of having your own product come alive. Intermountain Private Label offers a wide variety of custom formulation services including liquids, capsules, sprays, powders, and more.